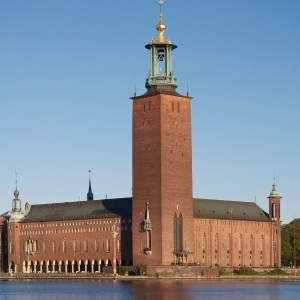 The city of Stockholm publishes a free visitor map that has the museums of Stockholm listed. There are over 70 on the map! You could spend weeks visiting them all. We managed only a few. In addition to the VASA, the Nordik, Skansen, ABBA and Medieval Museum we also managed to go to the Kungliga Myntkabinett (Coin Museum) and the Nobel Museum. The Nobel Museum was quite thoughtful. 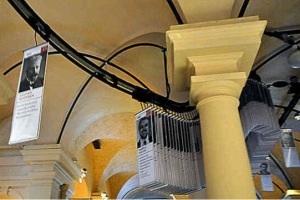 Pictures of the recipients of the Nobel Prize circulate through the room on a track similar to one a dry cleaner would use. Interesting to remember the different recipients, especially those who won the peace prizes. Though not a museum, City Hall seems like a museum. 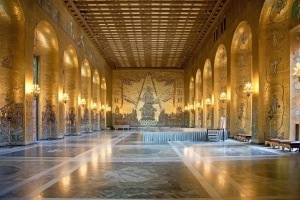 Beautiful building, especially the Gold Room. More food…because it’s so good!